***** As the pressures of our world, economy, and communities create a sense of urgency for us to rethink teaching and learning, Personalized Learning is surfacing as the most effective and aspirational way ignite the passion of learning for everyone. Smarter Squared is an outstanding resource for school leaders, teachers and students to move beyond the aspirational state and truly transform learning so everyone can succeed. Thank you to Pat and the 28 educators from 12 countries around the world for your outstanding contributions to this work. Call to action: Read it and then pass it along to the person(s) you think of as you are reading. Laura Henderson, CEO Epiphany Learning LLC. Personalized Learning has genuinely transformed our district and dramatically accelerates the progress and grades of our students. All future-oriented educators should be immersing themselves in personalized learning, and we are grateful that Smarter Squared includes the information for everyone to advocate for the use of personalized learning. Devin Vodicka, Ed.D., Superintendent, Vista Unified School District; winner $10 million XQ grant. Share personalized learning across your entire organization; enhance college and career readiness. 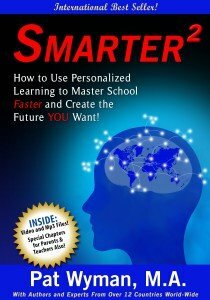 Chapters for school leaders, teachers, parents and students from 28 of the world’s best personalized learning experts. 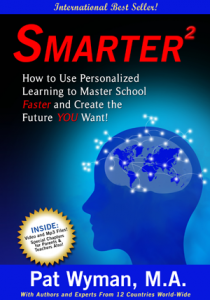 We’d like to share the Foreword, Introduction, and several videos for you from the Smarter2: How to Use Personalized Learning to Master School Faster and Create the Future You Want book. Download the FREE kindle app from Amazon and read this book on your computer or other device.